The Gallery Gap is a new podcast, launched on International Women's Day 2017, that focuses on the issue of in/equity in museums, exhibitions, collections, and programming. Hosted by Claire Kovacs and Melissa Mohr (director of education, Figge Art Museum). The podcast is produced by Lacy Scarmana and Alfredo Manteca for WVIK, in collaboration with the Figge Art Museum and the Augustana Teaching Museum of Art. In this first episode, Claire + Melissa explain the inspiration behind the podcast and reflect on the importance of diversity in their own collections at the Figge Art Museum and Augustana Teaching Museum of Art. In honor of Women's History Month, they first focus on gender — highlighting some of the important work created by women. The women range from the well-known to the unknown; from contemporary to historical; painters, sculptors, print makers and media in-between. Join in the conversation as we learn a bit more about the artists who shaped and reflected the world around them, women whose practice moved ideas forward, and people whose work enriches our lives. What would you do with pieces of wood and rope, a pair of antlers, and tar? Artist Alison Saar transforms all of these, and much more, to create dynamic sculptures and installations that examine the positioning of women and African-Americans, both throughout history and in contemporary culture. This week on The Gallery Gap, Melissa and Claire talk about Alison's artistic career, including an exclusive interview with the artist herself. Alison Saar lives and works in Los Angeles, and is represented by the LA Louver Gallery in Venice, Calif. Her artwork is in the collections of many museums beyond the Figge, including the Metropolitan Museum of Art in New York and the National Museum of Women in the Arts in Washington D.C. This week, Claire and Melissa sit down with Chicago-based artist Kiam Marcelo Junio to talk about their work, their recent exhibition and performance at the Augustana Teaching Museum of Art, and the obligation of institutions to create space and community for and around marginalized voices. Kiam, Claire, and Melissa reflect on the role of institutions to not only engender these conversations but to create equitable, just, and sustainable spaces. Melissa and Claire talk about the intersections of art, Earth Day, and the March for Science through a closer examination of artists Katja Loher and Maria Sybilla Merian. Loher is a contemporary artist whose work was exhibited at the Figge in 2014, and combines performance art, music, and dance to create spaces that interrogate the balance between humans, nature and technology. In her exhibition Videoplanet - Orchestra, Loher projected onto orbs hanging in the galleries - the result of which provided an awe-inspiring space, quite literally for Melissa. Merian, working some centuries earlier, was one of the first artists whose work focused on insects in their environments. Her travel, her drawings, and her close observation of nature made her a person ahead of her time. ATMA owns three drawings by Merian, so tune in to hear Claire describe one of them, and situate Merian within her rightful place in the evolution of science, as well as its intersections with art. Claire and Melissa also provide a bit of information about Earth Day-related events and the March for Science satellite march, happening in the Quad Cities area. Be sure to listen, and participate in the many activities happening this coming Saturday. In this episode, Melissa and Claire discuss a couple of recent films that grapple with the aftermath of WWII and the Holocaust, and pick up where they left off in their conversation with Dr. Jonathan Petropoulos. He discusses the future of restitution, from the recent passage of the HEAR (Holocaust Expropriated Art Recovery) Act, to some of the future problems in the field. In the first part of of a two-episode conversation about art and race in the Quad Cities, Claire and Melissa speak with Chicago-based artist Jefferson Pinder. His Figge exhibition, Ghost Light, is on display through June 4. In it, Pinder has created a site-specific performance installation that explores race in the midwest through multi-faceted portraits of personalities from the Quad Cities area. As an interdisciplinary artist, Pinder creates performances, video work, and objects that challenge viewers to think critically about our highly polarized society. In this episode, Pinder speaks about how the exhibition has brought personal histories and race to the forefront through three live performances that have been documented and added to the multi-media installation over the course of the exhibition’s run. Kara Walker's artwork The Emancipation Approximation is on view at the Figge until August 27. This series of 27 silkscreen prints features the provocative silhouettes for which Walker is known. Claire and Melissa discuss Walker's life, as well as this series. As an allegory the Antebellum South, The Emancipation Approximation addresses the harsh realities of slavery and its continuing effect on American society and racial identity. Though often the subject of public scrutiny, Walker's work is an engaging opportunity for all viewers to consider race, identity and personal perception. In this episode, we switch things up a bit, and Melissa talks to Claire about the Augustana Teaching Museum of Art's current exhibition, Organize Your Own: the Politics and Poetics of Self-Determination Movements. The traveling exhibition, organized by Daniel Tucker, is currently on display in the galleries through October 28, and features work by nine artists and artist collectives whose work responds to the history of multi-racial coalitions organizing against poverty, oppression, and racism. Claire talks about why she brought the exhibition to campus, as well as her reasoning behind the direction of the programming. The episode then focuses on the first exhibition-related event: the Rainbow Coalition panel that took place on August 30. The Rainbow Coalition was a multi-racial coalition that formed in Chicago in the late 1960s to work against racism, poverty, and oppression. The panel included representatives from groups who comprised the panel: the Illinois Black Panthers Party (Stan McKinney), Rising Up Angry (Michael James), the Young Lords (Antonio Lopez), and the Young Patriots (Hy Thurman), and was moderated by Brian Lovato (Augustana College). They discussed how the Rainbow Coalition came into existence, the work it accomplished, and its impact and importance on the contemporary moment. Melissa asks Claire about her recent experiences at the Biennial Midwest Artists Symposium, organized by the Illinois Women Artists Project (IWAP). Now in its fourth iteration, the symposium focused on Midwest women artists from the 1960s-1980s. In continuing their exploration of IWAP, Claire and Melissa next turn to an exhibition at the Figge, Irma René Koen: An Artist Rediscovered, which is on display through 2017. Exhibition guest curator, Dr. Cynthia Wiedemann Empen was first drawn to the idea through her participation in the very first Midwest Women Artists Symposium, which was held in 2011. It was in researching for the symposium that Cynthia came across the artist Irma Rene Koen, a Rock Island native. Hear from Cynthia, as well as Figge Associate Curator Vanessa Sage, as they reflect on the project’s creation and importance to the Figge’s exhibition plan. This episode continues Claire and Melissa’s three part series about the National Museum of Women in the Arts (NMWA) and its 30th anniversary. In this episode, Claire and Melissa transition from NMWA’s founding to an examination of its collections, exhibitions and programs, all of which support public engagement with women’s artistic accomplishments. Although it is a relatively a young collection, NMWA holds over 5,000 artworks from the 16th century to the present, created by over 1,000 women artists. In addition to exhibiting works from the permanent collection, NMWA’s special exhibitions rotate and showcase artworks by both established and emerging artists represented by collections around the world. The landmark exhibition, Magnetic Fields: Expanding American Abstraction, 1960s to Today (on view in D.C. until January 21, 2018), is one such exhibition. To help broaden the scope of discourse, Associate Curator Ginny Treanor joined the conversation by phone and revisits the story of NMWA’s founding from a curatorial angle, while speaking to her curatorial practice as it relates to NMWA’s mission. Director of Public Programs Melani Douglass was also available for an interview, and shares with listeners one of the museum’s public programs that really supports the idea that women in the arts can be power catalysts for change. This initiative is called Women, Arts, and Social Change, which creates a space for women from diverse backgrounds and disciplines to gather and combine their voices for social consciousness and empowerment. This week, Claire + Melissa pick up where they left off by talking about the Guerrilla Girls, an anonymous group of feminist artists. The Guerrilla Girls’ work on gender, racial and socioeconomic equity in the art world was the catalyst for this podcast. Claire and Melissa chat about how the Guerrilla Girls got their start in the 1980s, as well as their recent visit to the Quad Cities. Inspired by the Guerrilla Girls’ work on gender balance in the Metropolitan Museum of Art, Melissa and Claire do their own ‘weenie counts’ in the galleries of the Figge and the Augustana Teaching Museum of Art (ATMA). Have a listen to see how our community’s museums stack up. The Gallery Gap launched in March in recognition of National Women’s History Month. Women artists are not the sole focus of this podcast, but they have certainly been the primary focus of this month’s episodes. To wrap up Women's History Month, Claire and Melissa play a game called #5WomenArtists. Claire and Melissa discuss federal funding for agencies that support arts, culture and education, such as the National Endowment for the Arts, the National Endowment for the Humanities, the Corporation for Public Broadcasting and the Institute of Library and Museum Services. The establishment of these agencies was part of President Lyndon B. Johnson’s Great Society initiative, the goal of which was to address societal inequity that existed in 1960s America. Over the decades, these agencies have been a vehicle for change, though not without criticism from those who feel they exist outside what the scope of government. In spite of this, until 2017, a president has never suggested the complete elimination of support for any one of the organizations.As Claire and Melissa reflect on this, and the importance of these agencies to communities across the nation, both large and small, they bring the conversation home and discuss the importance of these funds to the Quad Cities. In observance of Yom HaShoah, Claire and Melissa discuss the importance of remembering the Holocaust, and begin a conversation with Dr. Jonathan Petropoulos, professor of European History at Claremont McKenna College, about how Nazi looting of artwork was a way for the Nazis to dehumanize people. This was a first step towards state-sponsored, systemic persecution and annihilation of European Jews and other groups who did not align with the Nazi party’s Aryan ideals. Jonathan, Claire, and Melissa also talk about the role of women in the repatriation and restitution work after the war. Join us next week for part two of this interview, where we will delve deeper into these topics with Jonathan. You can join the nation in commemorating the Days of Remembrance and honoring the victims of the Holocaust by attending an event near you. View the Days of Remembrance Events Map. Also, watch the video Why We Remember the Holocaust from the United States Holocaust Memorial Museum. Claire and Melissa honor the mothers in their lives by considering the perennial question of balance, and in this case, balance between being both an artist and a mother. There are plenty of women and artists who either by choice or by forces out of their control do not have children, but there are also women who, by birth, fostering, adoption, marriage or other arrangements, become mothers, and some of those women also make the choice to be artists. How they make those choices and navigate those responsibilities are as varied as there are women in the world, but this episode will highlight a few, and Claire and Melissa talk with one mother and artist who was part of Augustana’s recent exhibition, 4 Artists 4 Visions: Claire Hedden. Hedden is a practicing artist, who lives in Normal, Ill., and earned her MFA in ceramics from Alfred University. She has been part of exhibitions across the United States, and held multiple artist residencies at the Archie Bray Foundation. Towards the end of the exhibition at Augustana, Hedden came to campus to do a workshop with Augustana students, and gave a talk about her work. One main theme in Hedden’s conversations was her dual role as artist and mother, and these reflections were the spark for this episode. In the second part of a two-episode conversation about art and race in the Quad Cities, Claire and Melissa continue talking with Chicago-based artist Jefferson Pinder. As Pinder reflects on his Figge exhibition, Ghost Light, which closed on June 4, he shares his thoughts on the benefits having worked on such an immersive a project, as well as the challenges that came with living outside of the Quad Cities during its creation. Also in this episode, Pinder speaks about how the exhibition has shifted his practice and reveals what he is working on next. After a summer hiatus, Claire and Melissa jump back into The Gallery Gap with an interview of Quad Citizens Gaye Shannon Burnett and Jon Burnett regarding their summer film program, Urban Exposure. This program is hosted by the Azubuike African American Council for the Arts, and the program provides young people with an opportunity to be creative in a healthy and culturally rich environment, and is supportive of nontraditional applicants like women, people of color and other under-served populations. In light of the current Figge exhibition, Edouard Duval Carrié: Endless Flight, Claire and Melissa explore the topic of Haitian art with Haitian artist Edouard Duval-Carrié and Caribbean art scholar, Dr. Alfredo Rivera of Grinnell College. Since the 15th century, what is now known as the country of Haiti on the Caribbean island of Hispaniola has undergone several transformations — from its beginnings, inhabited by the indigenous Taino people, to Spanish and then French colonization, and with it the influx of African slaves, to a revolution for independence, then ruled by a series of varying political leaders, and on to a Haitian diaspora. All of this movement and migration has heavily influenced the art of Edouard Duval-Carrié. His researched-infused paintings and sculptures blend aspects of Haiti’s history over the course of time and place, and encourage viewers to consider where one comes from and and the role culture plays in one’s personal identity. In this episode, Claire and Melissa speak with Duval-Carrié about his start as an artist, and the path his art has taken over the years. They also chat with Dr. Alfredo Rivera, who has collaborated with Duval-Carrié on many projects, about situating his artwork into an art historical context. 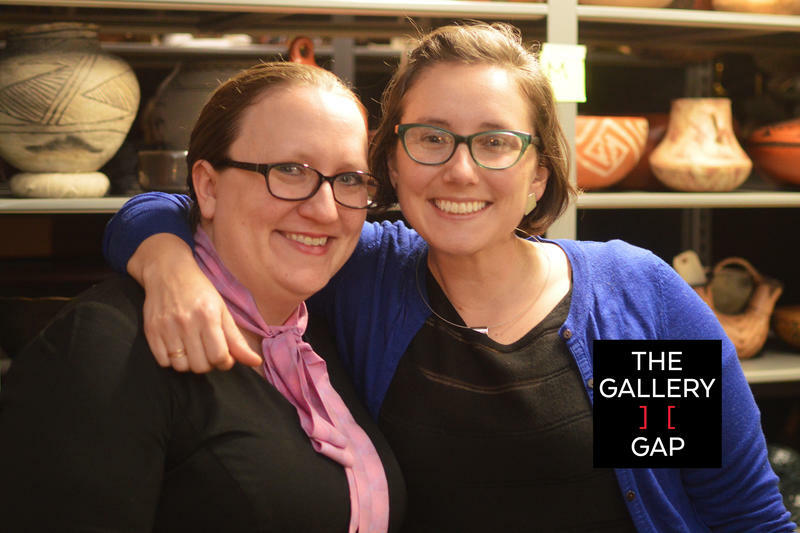 As Claire and Melissa close out the first season of The Gallery Gap, they have created a special three part series that celebrates the institution that inspired The Gallery Gap’s creation, the National Museum of Women in the Arts, or NMWA, located in Washington, D.C. The Gallery Gap began in March of 2017 during National Women’s History Month after a call to action from NMWA, asking if members of the public could name, without hesitation, five women artists as part of their #5womenartists campaign. Begun in 2016, #5womenartists has expanded to include hundreds of museums, and in 2017 was honored by the American Alliance of Museums, who gave it a Gold award in Digital Communities at the annual Media & Technology MUSE Awards. Also in 2017, NMWA has been celebrating its 30th anniversary. As part of that celebration, the museum is featuring the landmark exhibition Magnetic Fields: Expanding American Abstraction, 1960s to Today, on view until January 21, 2018. In this episode, Claire and Melissa introduce the three part series, and Magnetic Fields, before exploring NMWA’s founding, mission, and history with NMWA’s Director, Susan Fisher Sterling, who reflects on the past 30 years and looks to the institution’s future. This is the final episode in a three part series about the National Museum for Women in the Arts (NMWA), an institution that has done so much in its brief 30 years to advocate for equity in the arts and beyond. After conversations about NMWA’s founding, mission, collections, exhibitions and public programs, Episode 20 focuses on the exhibition Magnetic Fields: Expanding American Abstraction, 1960s to Today, on view until January 21, 2018. Claire and Melissa were joined via Skype by one of its co-curators, independent curator Melissa Messina. Magnetic Fields is the first exhibition to focus solely on the visual vocabularies of black women artists working in abstraction. Its curation allows space for under-recognized artists’ works to breathe, enter a dialogue with one another, and be considered within the larger historical context of abstract art.